Council staff had to clean up human faeces and vast amounts of litter after a gang of youths used intimidatory behaviour and took over a children’s play park. 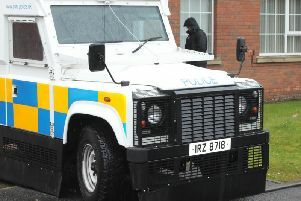 The under age mob, some as young as 13, were thought to have been fuelled with alcohol and suspected drugs during the rampage on Portadown’s Garvaghy Park. Deputy Lord Mayor Paul Duffy said the children’s playpark at Ashgrove Community Centre was closed on Sunday after the crowd became abusive to the centre manager. Armagh, Banbridge and Craigavon Council confirmed it had to carry out two major clean-ups at the park which included lifting vast amounts of rubbish and human faeces. The mob, ranging in aged from 13 to 20, have been involved in smashing windows, gathering in noisy groups outside properties and damaging garden plants. Meanwhile the Lord Mayor Julie Flaherty described how Council staff had to perform two major clean-up operations over the weekend including lifting ‘vast amounts of litter and human faeces’. She said: “I cannot condemn strongly enough the despicable acts that have taken place at Ashgrove Play Park. “This sort of behaviour is beyond logic and completely unacceptable. “Council staff had to perform two clean-up operations over the weekend which included lifting a vast amount of litter and human faeces, and the park even had to be closed on Sunday. Constable Shaw, from the Neighbourhood Team, said: “We have received a number of reports of anti social behaviour and criminal damage in the Garvaghy Park and Ballyoran Park areas. “We received a report on Tuesday 7 August, that a window had been smashed at a property in the Garvaghy Park area. On Saturday, 4 August, around 8:30pm, it was reported that a noisy group of youths had gathered outside properties in the Ballyoran Park area. “On Thursday 2 August we received a report that a window had been smashed at a house in the Ballyoran Park area. During the early hours of Friday morning, 3 August, just before 2am we received a report of plants being damaged in gardens in the Loughgall Road area. “We take all reports of anti social behaviour made to us seriously and we fully understand the effect anti-social behaviour can have on communities. What might seem like fun to those involved, can be distressing to the people whose property is targeted. “Police are here to listen to all community concerns and to work with local residents and partner agencies to find a solution to any issues. A spokesperson for the Housing Executive said: “The Housing Executive is aware of a series of serious incidents associated with this location. We treat allegations of this nature very seriously and we are urgently addressing the matter. “We are investigating these incidents and working on an appropriate response to them as well as liaising with the PSNI.